2018-2019 Appalachian Transition Fellowship Cohort! Hosts: Step by Step, Transformation Specialists, Coalfield Development Corp.
What is the Appalachian Transition Fellowship Program? 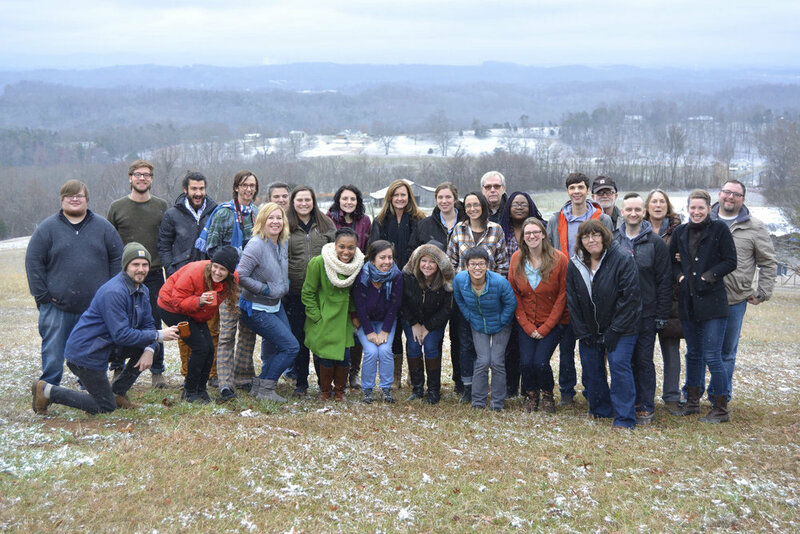 The Appalachian Transition Fellowship is a year-long, full-time, paid program designed for 10 emerging community leaders who are committed to working in Central Appalachia for the economic transition of the region. Central Appalachia is defined as West Virginia, Southwest Virginia, Eastern Kentucky, Eastern Tennessee, Appalachian Ohio and Western North Carolina. This program offers the opportunity to spend a year working within host communities to help foster cross-sector (education, nonprofit, for-profit, philanthropy, and government) partnerships, provide needed capacity to regional efforts, and build personal and professional skills. Through institutional placements, independently designed projects, training, and mentoring, the program gives emerging leaders and host organizations skills and networks needed to advance economic and social change in the region. Central Appalachia is engaged in a period of economic transition. While the decline of previously stable industries such as coal and manufacturing bring significant economic instability, it also offers Appalachia the opportunity to focus on the long-term well-being of its people and its communities. This economic transition allows regionally-based industries to prosper while also protecting and supporting the environmental and social well-being of the region. The Appalachian Transition Fellowship (AppFellows) seeks to increase the connectivity and capacity of Appalachian institutions and leaders while building a collective analysis and seeding projects to change the systemic problems in our region, leading to a just and sustainable Appalachian economy. Check out this short video that Catherine Moore a member of the inaugural cohort of AppFellows created about the program! I get worn down easily. I wake up cranky on a Monday and quickly fall into the cycle of “this isn’t going to work,” “I don’t know what I’m doing, I feel like someone else should be doing this,” or “I don’t see how doing this is going to change the state of things.” I feel like a majority of mental space goes towards talking myself down from these feelings. I recently realized I have to believe in this work as much as I want others to believe in it. I mean, I feel like I’ve believed in this work for a long time but it’s taken me awhile to realize how much of these anxieties is founded in doubt. We have to work to see the world that is possible ourselves if we expect to bring others along with us. If I do not see this world that’s possible in the places where it already exists and believe that it can happen on a larger scale, how can I look into the eyes of another person and tell them that I know we can get there together? Gramsci said, “to tell the truth is revolutionary.” And I’ve realized since thinking hard about my doubts that I have a lot of truth to share. In communities where people don’t know whether or not their children are being exposed to toxic chemicals while playing outside during recess, people stand up and demanding accountability. In prisons across the country, people are suffering consequences for demanding humane treatment. In workplaces, kitchen tables, streets, and churches around the globe, people gather - kind of like I do when I see my App Fellows cohort - to heal, strategize, and disrupt. These are the places where it’s happening. My truth is: I am one of many and this is already happening. I am already here, I might as well roll up my sleeves and help out. I am already here, I might as well trust those around me. I am already here, I might as well trust myself. We're excited to share this evaluation report of the first cycle of the Appalachian Transition Fellowship program. Conducted by Rural Support Partners, the report lifts up many of the strengths and successes we heard over the year of the fellowship as well as the holistic contributions the program made in the lives of young leaders. Through this investment in their leadership and skills, fellows were able to stay or return to the region to tap into their talents and ideas, to be creative problem solvers, and to build opportunities for cross-sector collaboration and impact through their fellowship projects in communities throughout Central Appalachia. We welcome your thoughts and questions on the report's findings! Please contact appfellows@highlandercenter.org or call 865-850-3333 for more information or to share your feedback.